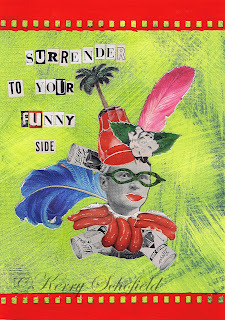 I was inspired by John Waters for this week's post for Illustration Friday. I went to see John Waters' live performance at the University of South Florida this past week. Well, it was quite funny to say the least. John Waters is the American filmmaker of Hairspray and Pink Flamingos among others. He is also a journalist, photographer and visual artist. The theater was packed as hundreds showed up for the show. Waters did not disappoint. He pokes fun at himself and those like him and was really very funny. This collage uses images from 1940s and 1960s vintage magazines. If cats had wings, I think they would fly to heaven and sit on the moon. Sometimes I think my cats think they can actually fly. Maybe that's why they like birds so much. Have you ever seen a cat jump and fly on trees only to get stuck. They seem to love high places for some reason. When they get in a wild mood, they run and leap with no thought of the ground. Then they get in all sorts of trouble getting stuck atop something, whether it be a shelf or on top of a roof! If I must deal with dust, let it be star dust where I can dream of growing wings and sitting on the moon! The colors of a timid flamingo. Here's wishing everyone a happy and ambitious 2011! I tried my hand at a couple of ATCs. I used collage images from 1940s and 1960s Life magazines. They're alot of fun to read as well! It was a few years ago but people weren't all that different and many of the same products we use today were advertised. Of course, there was World War II but we have our own brand of wars today, unfortunately. As for resolutions, I'm not too much on making them myself. I do hope this year to finally graduate from collage after going back to school later in life, paint with joy in my heart and write some noir poetry.